Western blot analysis of total extracts from various cell lines using ABHD6 (D3C8N) Rabbit mAb (upper) or β-Actin (D6A8) Rabbit mAb #8457 (lower). 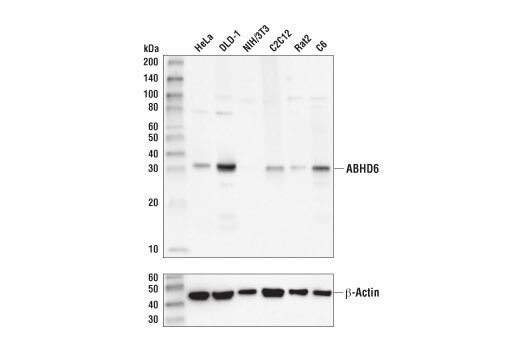 ABHD6 (D3C8N) Rabbit mAb recognizes endogenous levels of total ABHD6 protein. Monoclonal antibody is produced by immunizing animals with a synthetic peptide corresponding to residues surrounding Ile121 of human ABHD6 protein. ABHD6 (α/β-Hydrolase domain-containing 6) is a monoacylglycerol lipase, ubiquitously expressed with the highest expression in brown adipose tissue, small intestine, and brain (1). A high-fat diet upregulates ABHD6 mRNA expression in small intestine and liver, and ABHD6 knockdown protects against high-fat diet-induced obesity, hepatic steatosis, and systemic insulin resistance (2). In addition, it has been shown that ABHD6 is a negative modulator of glucose-stimulated insulin secretion (3). In the central nervous system, ABHD6 is expressed postsynptically and degrades the endocannabinoid 2-arachidonoylglycerol (2-AG), an endogenous activator of cannabinoid receptors (4,5). Inhibitors of α/β-hydrolase domain 6 (ABHD6) have been actively pursued as a promising approach to treat inflammation, metabolic disorders, and epilepsy (2,6,7). Lord, C.C. et al. (2013) Biochim Biophys Acta 1831, 792-802. Thomas, G. et al. (2013) Cell Rep 5, 508-20. Zhao, S. et al. (2014) Cell Metab 19, 993-1007. Blankman, J.L. et al. (2007) Chem Biol 14, 1347-56. Marrs, W.R. et al. (2010) Nat Neurosci 13, 951-7. Alhouayek, M. et al. (2013) Proc Natl Acad Sci U S A 110, 17558-63. Naydenov, A.V. et al. (2014) Neuron 83, 361-71.